There are quite a few of us who indulge in nail biting during times of stress or excitement, or when bored or inactive. However, in compulsive nail biting, people indulge in this behavior to such an extent that it causes bleeding, bruising, infections, and major damage to the fingernails and the area around them. Why does it Occur and Why is it a Problem? 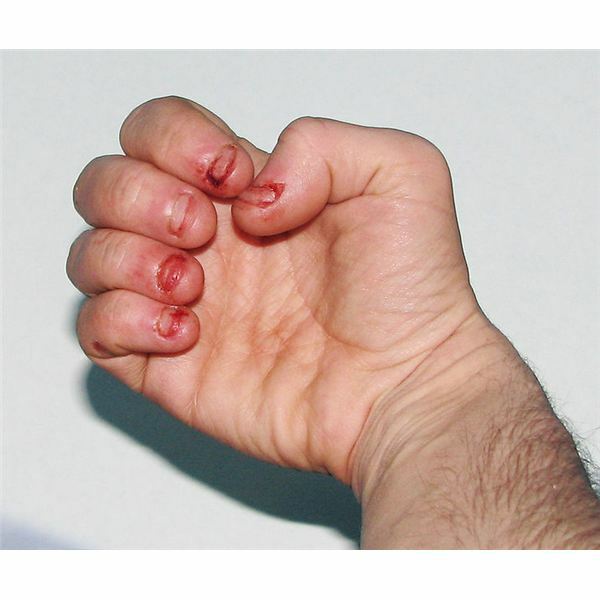 Compulsive nail biters often suffer from obsessive-compulsive disorder and body dysmorphic disorder. Onychophagia is considered to be an OCD spectrum disorder and people often don't realize that they are doing it. They only become aware of it when the nail biting stops. This disorder, which falls under the category of repetitive self-mutilation, often runs in families. It can make the fingertips red and sore. The cuticles may bleed and the nail beds and the mouth become prone to frequent infections. It may also result in deformed nails and abnormal nail growth. Often, a poor self-image or a deep-seated guilt or anxiety over an unresolved problem is the reason for compulsive nail biting. Over-stimulation or excitement and stress, and under-stimulation or inactivity and boredom often act as triggers to this compulsive behavior. An imbalance in the neurotransmitters present in the brain may also be a likely cause of this self-mutilating behavior, although there isn't a lot of evidence to support this claim. Compulsive nail biters tend to hide their hands and avoid social contact as much as possible. They feel depressed and shamed by their disorder which then causes major problems with their work, relationships, and daily life. Like all other obsessive-compulsive spectrum disorders, this one also requires treatment. Antidepressants or SSRIs, typically used to treat other obsessive compulsive spectrum disorders, can bring about improvement in nail-biting behavior. However, they may take up to several weeks before they begin to work and so are not particularly effective unless accompanied by psychotherapy. Cognitive-behavior therapy is the most effective psychotherapeutic treatment option used for compulsive nail biting and it involves habit reversal training. The first part of HRT is self-monitoring and it aims to help the individual become aware of the problem itself. For this purpose, self-monitoring sheets are given to the patient and he/she is asked to keep a log of when the episodes occur,how long they last, how strong the urge was to bite the nails, and what they were doing that may have triggered the compulsive behavior. The second stage involves learning progressive muscle relaxation, typically by listening to taped instructions. The technique aims to improve the focus of the individual and to reduce his/her tension. Once the progressive muscle relaxation is learnt, the individual is taught diaphragmatic breathing to help them achieve a relaxed state. It also helps the individual to become more aware and alert to the sensations that he/she is experiencing at a given point in time. HRT also involves stimulus control which aims at identifying and avoiding or changing the circumstances or moods that cause the nail biting OCD. Another therapeutic technique known as Competing Response aims to provide an alternative to nail-biting. So, the individual may be encouraged to keep their hands busy by performing other activities such as knitting or beading or satisfy their urge to chew with chewing gums. Along with these conventional treatments, you might want to try your own strategies to stop you from indulging in compulsive nail biting. For example, strong-smelling perfumes applied to the hands or jangling bracelets around your wrists will raise your awareness of what you are doing when your nails are near your mouth. Gloves and adhesive bandages over nails can act as a physical barrier to biting.